26th August, 2007, Bhopal, M.P. Well ! Today the is a great a day for us as from surveying Bhopal to now Madhya Pradesh, we have searched every nook & corner of the state to who are the best in Channel & Retails, although we didn't separate the channel from retails it just the matter of time we able be able to do that, probable next year. How I hope, this trend continues for ever and we actually start greeting each other with and it become a IT UTSAV : IT fraternity should make this day, their own. The enthusiasm shown by the Channels in state of Madhya Pradesh has made our will stronger to make the IT Diwas, a celebrative and a repetitive affair. Next year in 2008 we will include Chhattisgarh and make it a bigger & better event, such a event conceived for the first time in the entire Madhya Bharat. In 2008, we will celebrate on again on the 26th of August, again. 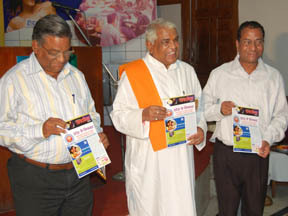 Unvieling of the Special Edition Shri Babulal Gaur, Addressing the audiance. SD's No.1 Computer Vendor and Reseller of the Year 2007 in Madhya Pradesh. to Shri Sudhir Arora of Computer Gallery. SD's No.2 Computer Vendor and Reseller of the Year 2007 in Madhya Pradesh. SD's No.4 Computer Vendor and Reseller of the Year 2007 in Madhya Pradesh. to Shri Ravi Bajaj of Centronix Computers. SD's No.5 Computer Vendor and Reseller of the Year 2007 in Madhya Pradesh. BUSINESS AUTOMATION PVT. LTD., INDORE. SD's No.6 Computer Vendor and Reseller of the Year 2007 in Madhya Pradesh. to Shri Deepak Shrivastav of Business Automation. BYTE PERIPHERAL SYSTEMS PVT. LTD. INDORE. SD's No.7 Computer Vendor and Reseller of the Year 2007 in Madhya Pradesh. to Shri Manish Goyal of Byte Peripherals. SD's No.9 Computer Vendor and Reseller of the Year 2007 in Madhya Pradesh. to Shri Deepak Wadhkar of Computer Gallery. 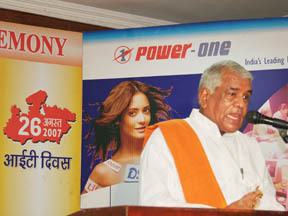 SD's No.10 Computer Vendor and Reseller of the Year 2007 in Madhya Pradesh. VELTRONICS INDIA PVT. LTD., INDORE. Zoom View SD's No.11 Computer Vendor and Reseller of the Year 2007 in Madhya Pradesh. to Shri Sanjeev Gupta of Computer Gallery. SD's No.13 Computer Vendor and Reseller of the Year 2007 in Madhya Pradesh. to Shri Ramji Nagori of Computer Palace. SD's No.15 Computer Vendor and Reseller of the Year 2007 in Madhya Pradesh. SD's No.18 Computer Vendor and Reseller of the Year 2007 in Madhya Pradesh. Zoom View SD's No.19 Computer Vendor and Reseller of the Year 2007 in Madhya Pradesh. Zoom View SD's No.20 Computer Vendor and Reseller of the Year 2007 in Madhya Pradesh. to Shri Sandeep Gupta of Powertek Electronics.